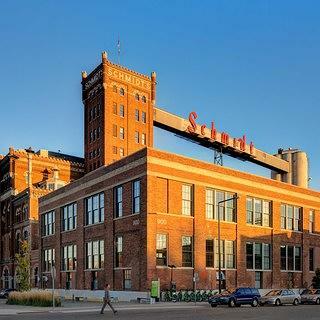 When Owen Metz and the housing development company Dominium were approached by the city of St. Paul, Minnesota, about rehabilitating the Jacob Schmidt Brewery, they were fully aware of the enormity of the project. But they also saw the potential for an extraordinary complex that could benefit the city in more ways than one, and today, the Schmidt Artist Lofts certainly live up to those expectations. Housing 247 lofts with income limits to ensure rents remain reasonable, the former brewery has been a boon for both artists and the entire St. Paul arts scene. 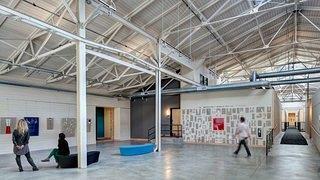 “Once we understood the building more and the opportunities that it had for subterranean studio spaces, and observed how that area of town is a pretty strong arts community, it was just a perfect fit to [use as] low-income housing for artists,” says Metz, vice president and project partner at Dominium’s Minnesota headquarters, and lead developer of the Schmidt Artist Lofts project. Residents enjoy the building's rooftop patio. After it opened in 1855 as the Stahlmann Cave Brewery, the property was purchased by Jacob Schmidt in 1900 to replace his old brewery, which had burned down the previous year. Schmidt wanted a brewery that reflected his aspirations to become one of the most prominent brewers in the country, so he hired Chicago architect Bernard Barthel to bring his vision to life. The result was a massive, Gothic-influenced marvel with several outbuildings, rivaling the breweries of much larger companies. The Jacob Schmidt Brewing Company used the building until 1954, when declining sales forced the company to merge with Detroit-based Pfeiffer. Several different brewers set up shop there over the next half-century but found minimal success, and the building finally fell vacant in 2002. With the harsh Minnesota winters taking a heavy toll, many feared it would soon deteriorate beyond repair. Desperately seeking a use for the property, the city of St. Paul brought in Dominium to tour the building in April of 2007. Dominium specialized in affordable housing, and believed the former brewery could be used as such. However, even with the financial assistance of the federal Historic Tax Credit (HTC) and the Low-Income Housing Tax Credit, a renovation project of that magnitude remained unfeasible. One of the lofts' several galleries, which residents can use to display their artwork. Unsurprisingly, not all the challenges facing the project could be found on the balance sheet. For starters, fitting apartments into a structure not remotely meant for that purpose was no small task. Hardly any of the floor plates aligned, disrupting both vertical and horizontal air circulation. Many areas of the building lacked windows. And around 60 brewing tanks needed to be demolished or cut out with torches to clear out space, costing $3 million. “It was a very complicated process just to get the building ready to be put back together, without really knowing what you’re going to get until you move everything out of there,” says Metz. 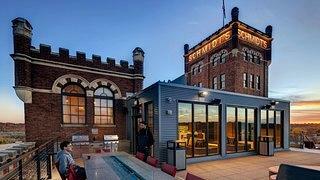 The renovation was completed in early 2014, and the Schmidt Artist Lofts have been thriving ever since; currently, they are fully occupied with an extensive waiting list. Picture-hanging rail systems allow residents to display their work in the corridors, and the building is filled with galleries that they can rent out for entire exhibitions.